Be aware of the temperament and tone of your home. “Emotional contagion” affects all relationships, from marriage to business to professional sports. Try to under-react to your teen and not match his or her high emotional state. Try to be business-like. Sometimes, creating distance can be most effective. 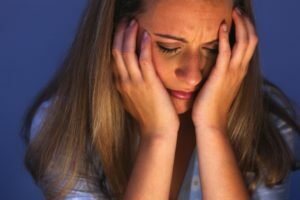 Step back and think about the reasons for your teen’s distress and the best ways to cope with it. If you know the cause, you’ll have a better idea of what you can do to help, whether it’s leaving her alone for a few hours or making yourself available so she can vent. Be your family’s CEO (Chief Energy Officer). Don’t allow yourself to be overly influenced by a destructive energy and then unconsciously communicate that energy to others in your home. Parents are leaders and impact the family by their moods. Negative emotions spread fast and are highly toxic! We can’t check our emotions at the door when we walk in the house, but it pays to be aware of what you’re feeling. You can’t change what you don’t notice. You can’t fake “positive” for long, so genuine matters. Embrace realistic optimism. Have faith to tell the most hopeful and empowering story possible, but also be willing to confront difficult facts as they arise and deal with them directly. We don’t realize we’re being influenced by others’ emotions. Negative emotions are usually more catching than positive ones! One of the functions of sadness is to ask for help from others. Try to be tender and more attentive to your teen, even though he might be trying your patience at the end of a long day. 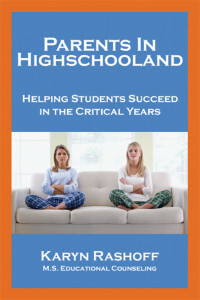 Karyn Rashoff’s first book Parents in Highschooland: Helping Students Succeed in the Critical Years is a caring and supportive account of her thirty-three years of dedicated work as a high school guidance counselor. Homework is a big issue at home, sometimes causing power struggles or warfare between teens and their parents. On this website, you can read stories from Parents in Highschooland. 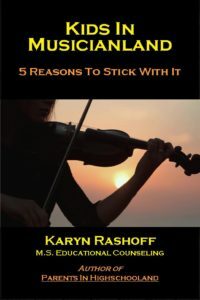 Also, Karyn offers practical tips and suggests helpful resources for parents and educators. Check back regularly for more information including upcoming presentations, classes, and book signings. I invite you to send me your family’s personal success in Highschooland to possibly share with other readers in my future book. I look forward to hearing from you at info@karynrashoff.com. But I wouldn’t expect anything but the best which is your norm. I am blessed to have you as a long time friend and you are missed dearly by me and our precious students. Congratulations mi Amiga! Great web site. Even though I don’t have highschooler, I can’t wait to read the book and give a copy to my daughter. What a great accomplishment. I’m ordering a copy to share with my daughter. She should find this interesting as she pursues her child psychology degree!